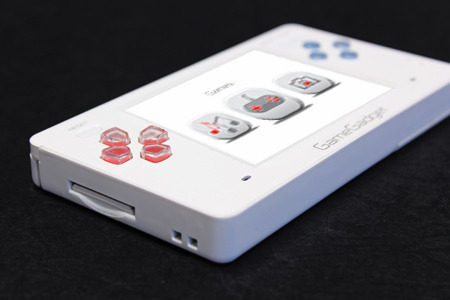 Today saw the announcement of the GameGadget, an Open Source handheld video game system set to hit stores by the end of the year. Can it beat Android? November 21st saw the announcement of the GameGadget, an open source handheld video game system that hopes to make a dent in a market where long-time industry giants Nintendo and Sony are struggling with their respective 3DS and PSP platforms. Competition from both iOS and Android devices led Nintendo last year to show its first loss in years, and things aren’t much better at Sony, with their upcoming next-gen handheld system, the Vita, slated to launch early next year, missing the holiday season. The GameGadget is expected be available by the end of this year, and developers interested in the platform are encouraged to register at GameGadget.net. An app marketplace similar to Apple’s App Store or Google’s Android Market is slated for an early 2012 launch. There was no word on whether an array of games will be available when the device debuts next month. The GameGadget press release is light on specifications for the new handheld device, beyond stating that it runs a flavor of the Linux operating system. There’s no apparent information on processor speed, graphics power, memory, touchscreen interface availability, nor WiFi capability. A look at the photos included with the press release reveals a generic handheld video game device with a set of directional button controls on the left, and four game buttons on the right. Shoulder buttons are partially visible, but there appears to be no joystick control. Considering the retro-focus of the device, as detailed in the press release, touchscreen control is probably not included. Video game accessory company, Blaze Europe are the people behind the GameGadget. In addition to selling accessories for modern video game platforms, they are also known for their hardware editions of older gaming systems, including the Atari 2600 and the Sega Mega Drive (Genesis), that come bundled with a collection of popular old-school titles. The GameGadget SDK promises support for current Open Source game development libraries, including SDL and DirectFB. Full documentation for the SDK is available to developers who register for the GameGadget. Programmers familiar with Linux-based game development appear to be the most suited for the GameGadget. All games downloaded from the GameGadget app market come with DRM fully-encoded, providing a measure of protection for the developer’s intellectual property. A revenue-share model between game publishers and GameGadget will be used for sales. Considering the GameGadget’s apparent focus on a platform for the re-release of older gaming titles, fans of those gaming classics need to pay attention when the new device fully hits the market early in 2012. Aside from offering a new lease of life for older games, it also intends to make developing directly for the platform as easy as possible. The GameGadget runs a Linux OS, and can therefore be developed for using the same libraries including the very popular Simple Directmedia Layer (SDL).